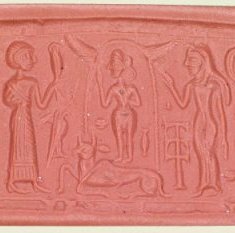 Readers of Zecharia Sitchin will be well acquainted with the cylinder seals created by the ancient Mesopotamians, particularly the Sumerians. These seals were small, delicately sculpted objects that were rolled across small, wet clay tablets to create an imprint. 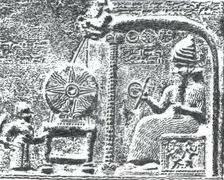 In effect, they were mini printing presses, and they provide us with a wealth of imagery and writing in cuneiform script from several thousands of years ago from the area which is now Iraq. Pre-dating the Biblical period, it has become clear that the writings emerging from this area's early civilisations strongly influenced later cultures of the Middle East, including the Jewish accounts of early history. Author Nicholas Swift advocates that the imagery from the cylinder seals parallels that of the Tarot of the Mediaeval period, an observation first made by the esotericist Madame Blavatsky (p12). 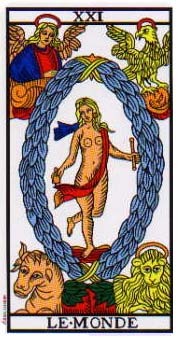 The Tarot is already thought to have been influenced by Arabic sources before it came to Europe. Drawing on Blavatsky's thought, Swift's thesis takes this idea further. He directly compares the enigmatic imagery of the Tarot with that of the ancient Mesopotamian cylinder seals and finds some remarkably strong correlations. The original Marseille Tarot was likely based upon ancient Mesopotamian imagery that had made its way into mediaeval Europe, he concludes. Perhaps considered to be heretical in those times, the symbolism of the ancient Arabic world was hidden in plain sight through conversion into the cards. The only problem was that the original symbolism was reinterpreted by the Tarot artists - the images contextualised into the 'modern' times of the mediaeval period. In addition, as a student of Persian and Arabic, Swift builds a case for a connection between the symbolism of the Tarot and that of the Sufis, the mystical teachings of Islam. A reader of Gurdjieff, Swift also finds parallels with his wisdom, in particular his enneagram. This then leads us into the Jewish mystical Kabbalah. The author delves into some deep philological arguments to draw these various strands together and, in so doing, creates a fairly comprehensive theory of the evolution of myth and symbolism in the Middle East - all in just 179 pages! Perhaps this was too ambitious an undertaking for the space available. The content of the book is deep and detailed, and the normal formalities of chapters and section headings have been stripped out of it, along with an index, and even concluding comments. So navigating the book is difficult. This is a great shame because I think his underlying thesis is a sound and even rather compelling one. But without underlying structure, the book becomes more of a thicket than a map. It is so deconstructed that I would almost call it Modernist. The author's deep fascination with Persian and particularly Arabic puns and homophones overwhelms the book, and I think more emphasis was needed as to why he thinks it so likely that Islamic stories and Sufi philosophy are pertinent to both the Tarot and myths of ancient Mesopotamia. To my mind, whilst these things may be connected tangentially, exploring the link in such depth seems unnecessary. I can see that the Tarot artists accessed the cylinder seals, considered them important and incorporated them into an heretical system that took its form in the cards. This relatively straightforward scenario precludes the need for Arabic word-games. I would have stripped out chunks of the linguistic debate and instead incorporated chapters, section headings and index. He later describes what might be described as a UFO encounter by the Sufi master Rumi at age 16, and how alien contact might have been described in the Book of Genesis in connection with the creation of alien-human hybrids (p73). Other Sitchinite correlations are found in some of Gurdjieff's writings, which the author nods towards. I've discussed this in a previous item on the subject of Gurdjieff. Although these arguments will interest my own readers, they are not the life and blood of 'Mirror of the Free'. It is in the comparison of visual symbolism that the book shines brightest. His analysis of the Wheel of Fortune takes him into the debate on reincarnation, and on Temperance we examine a link to the Kabbalah. It's all rather clever stuff. In one of his many detours, he explores whether left brain versus right brain functionality have a role to play in understanding some Biblical myths. And he provides a quite delightful telling of the Epic of Gilgamesh, the protagonist of which is, naturally, linked to the Strength card. There's much to consider in the way of ideas in this book. Although typo-free, its haphazard presentation and heavy-handed academic focus on philology do tend to get in the way of its essential message, though, which is a shame because its core thesis is rather engaging.